I recently bought a new bedroom set. It is all black. I want to repaint my bedroom to match. I'm thinking of the colors red, gray, black and white. How could I paint the four walls to make it a romantic bedroom? Any ideas on what color of bedding would be great. I really like this bold color scheme Tammy but it is a difficult one to pull off successfully. You need to use quite a bit of red to add warmth and drama but too much red and it could easily be overwhelming and certainly not a restful place to sleep. You may find that a feature wall in a rich shade of red will suffice with possibly red bedding too just to break up the solid black of the bed. Have a look at this page for some other ideas which may help you. 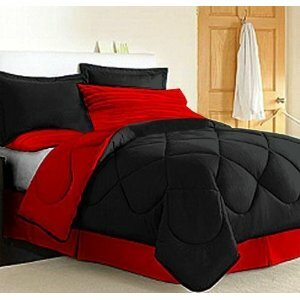 Would like to know the size of the king size comforter set that you are offering. Before I put the order in I would like to know the sizes for this. I look forward to hearing from as soon as possible. I like the comforter. Where did you get it?